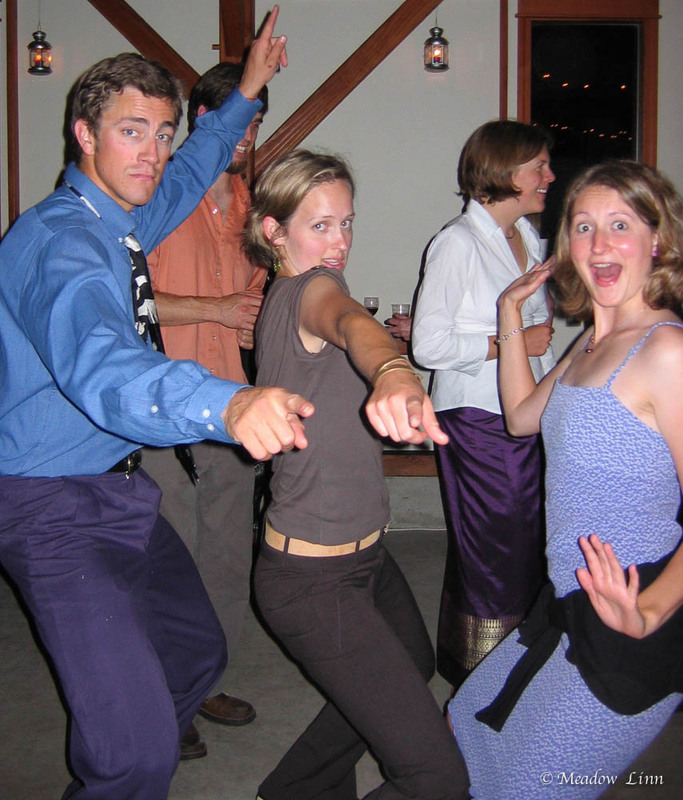 Are you the kind of person who gets groovy on the dance floor, or do you watch from the balcony? For most of my life, I’ve been an observer. I’ve watched my life play out in front of me in the same manner that a cameraman frames the scenes in a movie. For instance, one afternoon when I was a young child, my mom spied me through the front window. I was sitting on the porch watching the neighborhood children frolic in the garden. Concerned, she ran outside to ask why I wasn’t playing with them. I told her that I preferred to watch because I didn’t want to soil my clothes. My mom, who didn’t care if I got dirty, was perplexed, but she let me be. In high school I took up photography. Although I loved the artistry involved in taking and developing beautiful photographs, it wasn’t long before I also came to love how the lens allowed me to be one step removed from the action. As I viewed the world from a distance, I was able to be both engaged and disengaged at the same time. Being a consummate observer has many benefits. It provides a wonderful way to gain insights about people, relationships, and life in general. And, it’s much less messy. Rather than getting torn and bruised in the fray, I’m able to control my surroundings and get involved on my own terms. Standing on the balcony and gazing at those on the dance floor, however, also means that while there’s less opportunity for hurt, there’s also less opportunity for connection and belonging. Although in my adult years I’ve made a greater effort to waltz onto that metaphoric dance floor, I still find myself from time to time climbing the stairs back to the comfort of the balcony. Busyness is also a way that I’ve remained separate and in that comfortable place of observation. 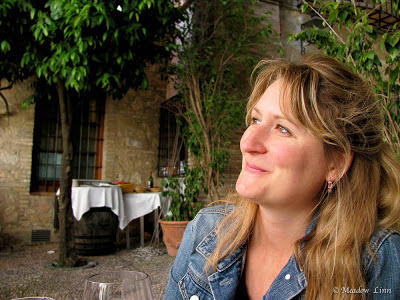 Although I want more than anything to feel connected, sometimes when a friend invites me out for a drink or a movie, I find myself declining because…I’m just too busy. It’s true. There’s a lot going on right now, and sometimes my head spins out of control trying to keep up with everything. But, the truth is, there’s always time for those we love, if we choose. While spending my life observing others, I’ve seen both unbridled joy and heart wrenching heartbreak in their lives. Meanwhile on the balcony, life remains pretty good. It’s safe, dependable, and controlled. To find love, however, I’m realizing it’s necessary to mingle on the dance floor. Although I don’t particularly agree with “No pain, no gain,” I understand what it’s getting at. In order to feel profound connection and unparalleled happiness, it’s necessary to play a leading role in my own life. The thought of an unknown outcome is terrifying. What if I’m not accepted? What if being vulnerable leads to something that doesn’t fit the narrative I’ve written for my life? What if it’s just too painful? And, the fear of giving up control: Who will man the camera if I transition from director of photography to leading lady in the film of my life? Wouldn’t that little girl sitting on the porch watching the other children have had more fun rolling in the mud and smelling the sweet scent of spring flowers? Are you an observer or a mingler? Are you on the balcony or on the dance floor? Where would you like to be? There are disadvantages and advantages to each, but sometimes we need to be willing to listen to the music and start tapping our feet in order to open the door to true happiness. When you’re on the dance floor, you’ll need sustenance. And since you’ll be grooving to the tunes and engaging with the people around you, you’ll want easy to eat and incredibly delicious finger foods. These are the perfect canapés for your next gathering. They are a harmonious blend of sweet, salty, and tangy. Plus, they’re gluten free! Toast the hazelnuts on a baking dish in a 350-degree oven for 10 minutes. (While the hazelnuts are in the oven, jump ahead to making the pastry.) When the hazelnuts are cool enough to handle, wrap them in a clean dishtowel and rub. This will remove the skins. Carefully, split each nut in half. In the bowl of a standing mixer, combine the brown rice flour, potato starch, tapioca flour, and salt. Add the coconut oil, egg, and water. Mix on medium-low until fully combined and the dough starts to come together. Turn off the mixer and gather the dough into a ball. If the dough is too dry, use wet hands to do this. With your palms, press the dough into a flat disc. Place the dough between two pieces of wax paper and with a rolling pin, roll the dough until is about an 1/8 inch thick. Remove the top piece of wax paper. 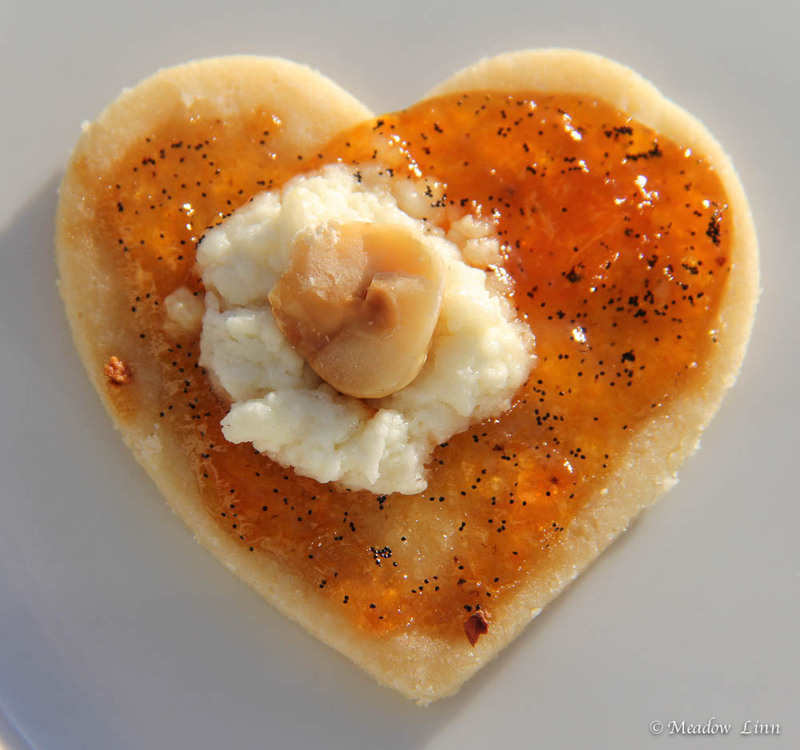 Use a 2-inch heart-shaped cookie cutter to make about 3-dozen hearts. 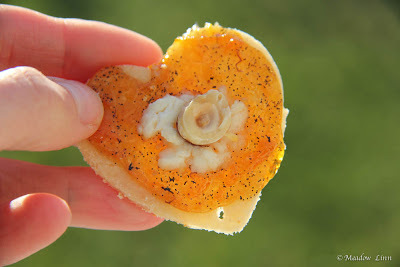 Using an icing knife or thin spatula, transfer the hearts to a baking sheet. Bake for 10 minutes. Meanwhile, with a sharp knife, make an incision lengthwise in the vanilla bean. Scrape the interior. 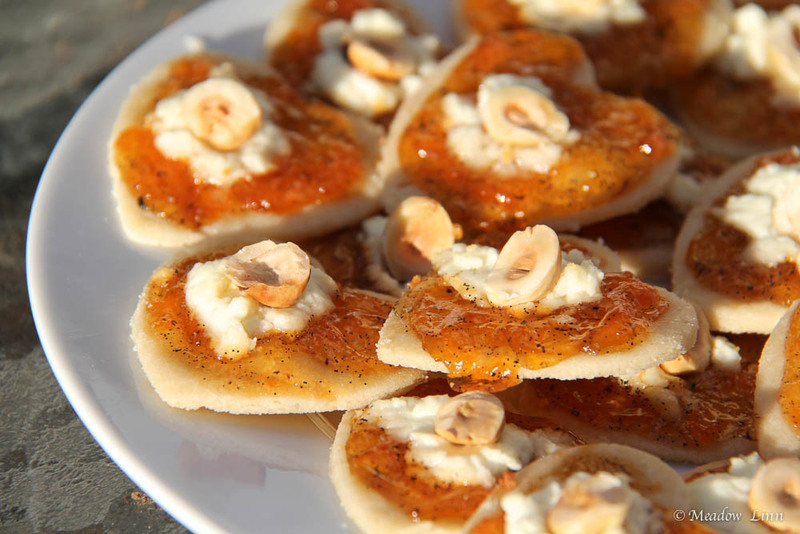 Mix the vanilla with the apricot jam in a small bowl. Set aside. Remove the hearts from the oven. Using an icing knife, generously coat each heart with the vanilla apricot jam. Put a dollop of goat cheese on top of each one. Return the hearts to the oven and bake another 15 minutes, until the jam is bubbling and the pastry is golden. 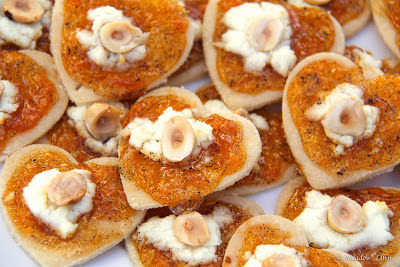 As soon as you remove the hearts from the oven, put a hazelnut (cut side up) on top of the warm goat cheese. Allow to cool. Enjoy! Thanks, Brenda! Meadow tested, mother approved. (My mom was my leading taste tester). Yep, I'm the kind to be 'standing outside the fire' as Garth Brookes would say. I find crowds and noise painful to be around, except in small doses. I can relate to people well on a 1 to 1 level, or even 1 to 5 or 6, but more than that I detach. But you are right - you've got to get in the mix to really participate in life. Just not sure that I'm ready to do that yet. I also agree that holding a camera is a great buffer in a way. I can join the masses with my camera but on my own terms. Dang, I sound like a control freak! I'm not really, though, lol. I just like my own company. Meadow, I love that you give us such wisdom along with GLUTEN FREE recipes! Can't get better than THAT! I so relate to this post. I think it has to do with being an Introvert. It is the way we process information. I read a great book on that...I"ll see if I can find what the title is. It is literally about how our brains are wired more than what our personalities are. It is all about how we experience life. REading the book took a lot of guilt off of me for being more of an observer. And yes, I do get out on the dance floor as i love to dance but it takes some courage to do so. And I do put myself out there, but not always, and I try to choose my spots wisely! Not always successful at that! Like Barb says, "time to bake some cookies"!!!!!!!! Your cookies are so beautiful! I'm listening to the rebroadcast of your mom's hayhouseradio show and she told about the story of your grandmother's help for this gluten-free recipe. I just had to see this, so jumped right over to this site. I saw a picture of them last time, but you didn't post the recipe. Congratulations, on your adorable creations! They remind me of heavenly cherubs. I have the Mystic Cookbook. Thank you for making the recipes very doable, simple, yet tested for deliciousness. I'm so glad I know it's something I can do. (I've tried some recipes by other people that I don't think have been tested for deliciousness or seem a bit overwhelming). I'm excited to try this one! Thank you so much for such a sweet comment. 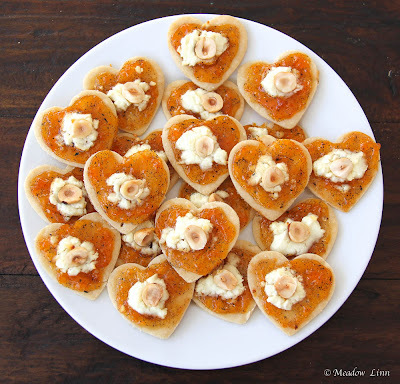 I hope you enjoy the Heavenly Heart Canapes. When they're made with love, they can't be beat!! Bon appetit!! Another meaningful post. There is a lot to be said about the balcony and the dancer floor people. I had a nearly permanent balcony seat growing up. I have evolved but still have challenges pulling away from the secure spot. I still must push myself. We don't relinquish our "balcony seats" so easily. We must build ourselves up daily and talk gently; it doesn't come overnight. Here's to enjoying the view from the balcony and at the same time occasionally stepping onto the dance floor to mingle for a bit! Thank you for your lovely comment, Barb.